There’s a better way to move your employees. 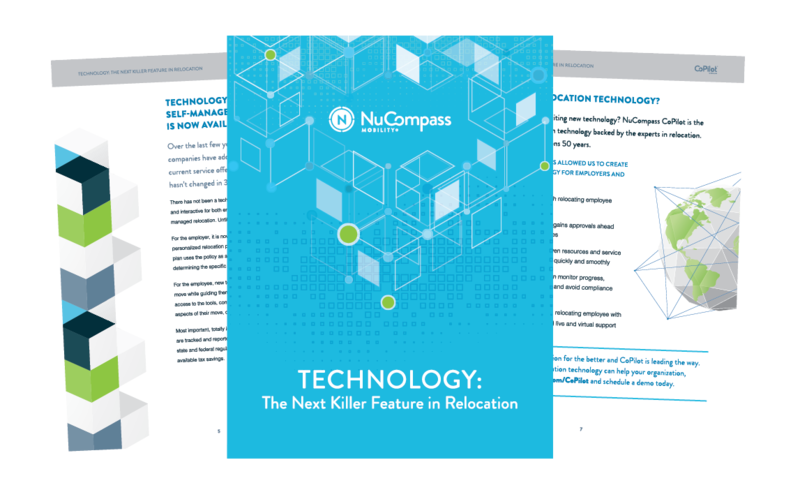 NuCompass CoPilot gives organizations the ability to relocate their employees effectively, while improving employee engagement and experience along the way. The way we approach relocation is different from the rest of the industry. We know that one size doesn’t fit all. Many organizations don’t need the most comprehensive and expensive programs on the market. Many also need more than just basic management. Even within the same organization, the relocation offering might be different depending on location or employee. We start by matching your organization’s needs — whether you need a comprehensive program, just the basics, or both — to provide the right experience for you and your relocating employees. Explore the variety of products we offer to meet any company need, the range of services we provide, and the technology that’s the backbone of how we relocate each and every person. Relocation services are getting kicked up a notch, thanks to a helping hand from technology. See why technology is not just game changing, but a necessary evolution for companies to embrace. CoPilot is changing the relocation paradigm — all while engaging employees and saving companies time and money. ©2019 NuCompass Mobility Services Inc. All rights reserved.